Traditional Haitian music called rara pulses like a heartbeat through Miami's Little Haiti neighborhood. It's kept alive in frequent street parties and now in a more formal classroom setting that educators hope will carry it beyond a core group of immigrant performers. In Haiti, rara (RAH-rah) season comes in the weeks before Easter. Dancers, singers, drummers and players of handmade horns take to the streets. They lead their followers on revels that could last hours and sometimes days. Like many traditions in Haiti, rara has its roots in Africa. The music blends Christian and Voodoo influences. The music's rhythms vary across the Caribbean country. Each season brings new songs on topical subjects and rara holds an important place in Haiti's political discourse. Every gathering is a chance to catch up on the latest community news as well. "Rara is really where you hear all the gossip. Just like when you go to a barber shop." That is according to Weiselande Cesar, whose cultural education group Tradisyon Lakou Lakay led a rara workshop for children at the Little Haiti Cultural Complex recently. Rara instruments typically include bamboo or plastic trumpets, horns made from scrapped tin or aluminum and drums strapped to the players to allow them to move freely. In Cesar's class, children ranging from kindergarteners to tweens used short, hollow batons to bang on blue plastic buckets for drums. Professional musicians playing traditional drums set a steady rhythm - BOM-BOM, BOM-BOM - which Cesar described as an opening prayer. The children kept the beat for almost two hours. Meanwhile, Cesar taught older students to carry their buckets in choreography that led them in serpentine lines through the class. 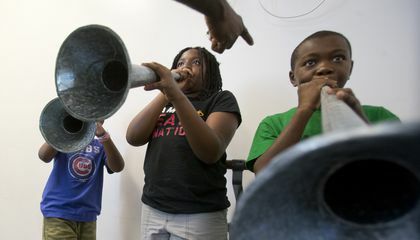 Wilnord Emile of the Miami-based professional band Rara Lakay taught his 10-year-old son and three other children to play aluminum horns. They blend their single-note tones in bursts with the drumbeats. The effort left them sometimes gasping for air, cheeks puffed. The summer workshop is the start of a long-term program. 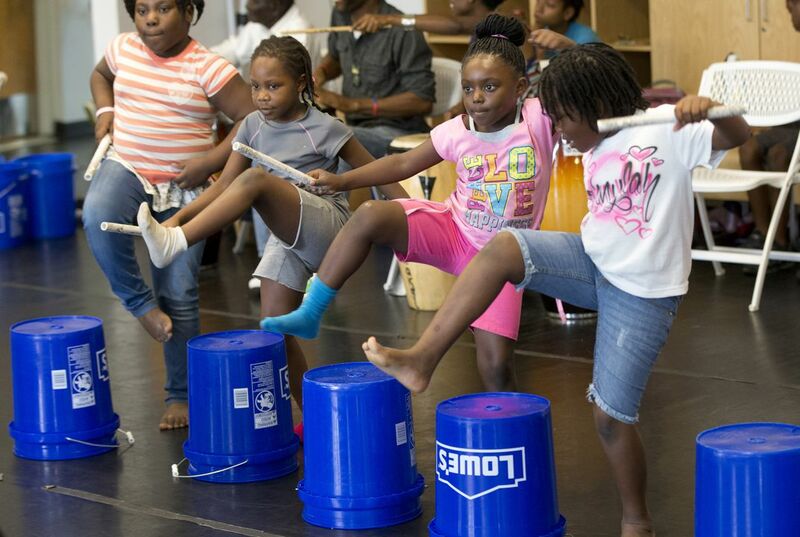 It incorporates rara and other traditional Haitian music and dance into after-school programs. That is according to the center's managing director, Sandy Dorsainvil. "We also realized that a lot of the techniques and a lot of the traditional songs are not recorded," she said. "It's not often taught, so we wanted to be able to teach this formally and then hopefully the tradition will keep on." Why is rara a good fit for classrooms? 'Rara' is a good fit for classrooms, because it teaches kids to just have fun with the music. ''rara pulses like a heartbeat through Miami's Little Haiti neighborhood.'' this quote is from the introduction paragraph. Rara is like a tradition it comes in the weeks before Easter.Basically everybody who plays music fill the streets. In Rara music it is a blend of christian and Voodoo influences.